I grew up with what my family, friends and I thought was simply a quirky bladder. I had difficulty with toilet training and, due to frequent bed wetting incidents and daytime accidents, wore training pants and plastic pants through first grade. Although I learned to conceal my problem, several years ago it became bad enough that “a quirky bladder” was no longer an acceptable description. My physician found a small, calcified benign tumor/cyst that was pressing on nerve roots in my “cauda equina”. The nerve damage and subsequent treatment for detrussor hyperreflexia and detrussor-sphincter dyssynergia left me nearly totally incontinent. 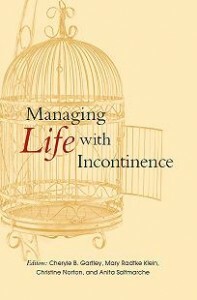 I successfully manage my incontinence with adult diapers, and with the help and support of friends and family lead a normal professional and social life. Posted in Shared Stories from People with Incontinence and tagged bedwetting, cyst, detrussor hyperreflexia, detrussor-sphincter dyssynergia, enuresis, nerve damage, tumor, urinary incontinence.